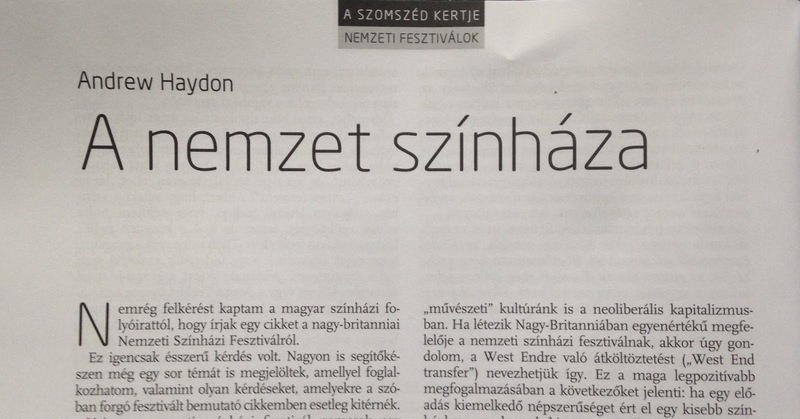 I was [recently] sent the following invitation to write a piece about The National Theatre Festival of Great Britain, by the Hungarian theatre magazine Színház. Is the national theatre festival in Great Britain a showcase of the supposedly “best” shows from all around the country, not only from a region? How representative is the festival? Which aesthetics are preferred by the Festival? How would you describe it currently? Progressive? Old fashioned? Are there any conflicts around the festival, and why? Is it supported by current politics/cultural-politics? Does it have a serious audience supporting it? Does it have an international audience? I imagine it would have been a great piece, but for one small problem: there is no National Theatre Festival of Great Britain. Or England, or Scotland, or Wales, or Northern Ireland separately. I’ve been abroad. I know exactly the sort of festival Színház’s editors meant: Theatertreffen in Germany, Warsaw Theatre Meetings in Poland, the Teaterbiennale in Sweden and so on. So, why don’t we have one in Britain? The most obvious answer is: British theatres are organised almost entirely differently to those in mainland Europe mentioned above in terms of contracts and ensembles. Almost everywhere else in Europe (it seems), each theatre has a permanent ensemble who are contracted for at least a season at a time and productions are designed to play in rep. In Britain, with painfully few exceptions, companies are assembled on a play-by-play basis. They rehearse, play the show for however many weeks, and then disband. It would be a logistical and economic nightmare to try to reassemble the ten most artistically successful shows of the previous season; it any time; in any city in the UK. Beyond that, there is also the question of Britain’s prevailing economic/ideological culture. As an Englander, it’s not until you travel outside the UK (and, by extension, the USA; from where we seem to be gradually re-inheriting a lot of economic policies at present) that you realise quite how profoundly based in neoliberal capitalism even our “art” culture is. In Britain, if we have an equivalent to the National Theatre Festival, it is, I suppose, the West End Transfer. Put in the most positive terms, this means: taking a show that has proved to be enormously popular in a smallish theatre that receives small amounts of state funding (all British theatres, even state “funded” ones receive a significant proportion of their budgets from corporate sponsorship and private donations), and transferring it to a larger, privately owned theatre; often charging a lot more money for tickets. These West End transfers tend to last for 12 weeks in their original form (because it is still difficult to get the entire original cast to commit, due to the fact that they may have prior film or television obligations), although second and third casts are not unheard-of. At best, the West End transfer is a meeting of artistic excellence and popular acclaim. In this trajectory, the next stage is the transfer to Broadway, where I’m given to understand ticket prices are even higher (a seat roughly the same distance from the stage for the same play could plausibly rise from £9 (€12) in previews at the Almeida to $239.25 (£156/€211) for a Friday night on Broadway). One does not have to be a genius to see the less positive aspects of taking art out of a public context and into a private one. Beyond this, I have a sense – perhaps one which is mirrored by controversies at other National Festivals of Theatre Excellence – that the UK would be quite resistant to this level of top-down organisation in quite such an explicit way. And there’d be yet more grumbling if it was held in London. Or not-in-London. And no one would be able to agree on what should be shown anyway. On balance, with UK theatre in its present fractured and immiserated form, I think we might have had a lucky escape.